Round Rock, Texas - Pitchers won't be the only ones concerned about "walkers" on Saturday, May 5. 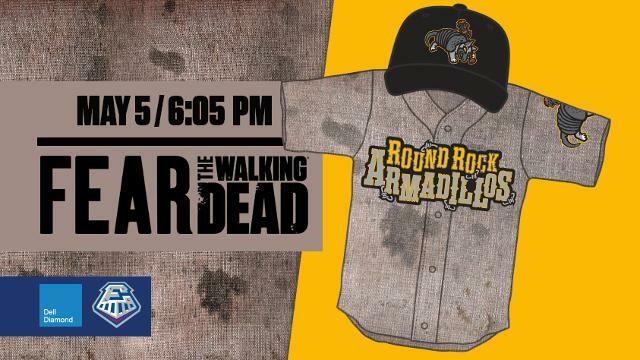 The Round Rock Express will transform into the Round Rock Armadillos to pay homage to the hit AMC television show Fear the Walking Dead. This offseason, the Express partnered with AMC to bring production of Fear the Walking Dead to Central Texas, with Dell Diamond serving as one of the primary sets for the hit show's fourth season. Over the course of several months, Dell Diamond was transformed into a post-apocalyptic set, home of the fictional Armadillos. "We are proud to further showcase the versatility of Dell Diamond alongside a great partner in AMC," Express President Chris Almendarez said. "To have the entire ballpark transform into a television set for several months, then be ready to go for Opening Day is a testament to the great staff we have here with the Round Rock Express." For the uniforms, the Express recreated the identity of the Armadillos using inspiration from the original logo concept seen on Fear the Walking Dead. The armadillo, the State of Texas' unofficial mascot, is featured on the cap and the jersey sleeve mimicking characteristics of the show's popular "walkers" and wielding a razor wire bat, a subtle nod to Fear the Walking Dead's predecessor, The Walking Dead. The jerseys appear dirty and worn, mirroring the wardrobe of the show's characters in the post-apocalyptic setting. The jerseys will be auctioned online during the game, with proceeds going to the Round Rock Serving Center, a nonprofit organization that carries out a community-wide mission of meeting human needs in Round Rock and beyond. Official Armadillo hats and t-shirts will be available for purchase online and in the Railyard Team Store, along with other unique merchandise highlighting the team's involvement with the show. Additional elements for the May 5 Fear the Walking Dead Night will be announced in the coming weeks. Fear the Walking Dead season four premieres Sunday, April 15 at 9:00 p.m. CT with subsequent episodes airing at 8:00 p.m. CT beginning Sunday, April 22. Produced by AMC Studios, Fear the Walking Dead is the #4 drama on cable among adults 18-49 and adults 25-54 in Nielson live+3 ratings. The series is executive produced by Scott M. Gimple, showrunners Andrew Chambliss and Ian Goldberg, as well as Robert Kirkman, David Alpert, Gale Anne Hurd and Greg Nicotero. This season stars Kim Dickens, Frank Dillane, Alycia Debnam-Carey, Colman Domingo and Danay Garcia, along with new series regulars Garret Dillahunt, Jenna Elfman, Maggie Grace and Lennie James. "We are excited to bring an international spotlight to the City of Round Rock and show the world all that Central Texas has to offer," Almendarez said. Crews worked round the clock to bring Dell Diamond back to life in time for Express Fan Fest following the show's last day of production at the ballpark in early March. The renovation process included replacing nearly all of the stadium's signage as well as a complete replacement of the playing surface and outfield berms by RS3 Turf. Over 120,000 square feet of new TifTuf Certified Bermudagrass sod was brought in. The renovation process required 10 sod crew members to install the sod and an additional 10 RS3 Turf grounds crew members to work on the field. More than 1,750 labor hours, 2,800 combined pounds of fertilizer and 23 tons of sand were required to rebuild the playing surface and berms. The Express open the 2018 season on Thursday, April 5 with a five-game series against the Memphis Redbirds (St. Louis Cardinals affiliate) at Dell Diamond. Single-game tickets, season memberships and flex plan ticket packages are on sale now.